Al Alberts' Showcase ran on WFIL/WPVI-TV from 1966 to 2001. In 2001, Al and Stella retired to the Gulf Coast of Florida. The Alberts have a syndicated radio show, Harmony, which airs Sunday nights on WPEN. What in the world is a bunyip? According to Bertie's creator, Lee Dexter, bunyips came at the end of the line of creation and got all the leftover parts. 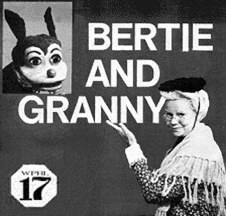 Bertie aired mostly on Sunday mornings and weekday afternoons on WPTZ-TV (later WRCV and KYW) until 1966, when it spent one season on WPHL ch. 17. "I don't think I EVER missed Bertie the Bunyip a single time on Sunday mornings...I always thought he was kind of a platypus or a dog, or something just completely made up from scratch... I stopped watching around 1964 because I was "too old and too cool" by then. 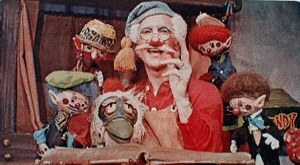 I do still remember some of the other puppets, like Sir Guy de Guy the fox, Nixie the Pixie, Humphrey the Rabbit, Fussy & Gussy, and Poochy the Pup. I left the Philly area in 1969, and I guess Bertie was long gone off the air by then." -Michael V. Asheville, N.C.
"I watched Captain Noah every morning before school up until about 1978 when I started middle school. 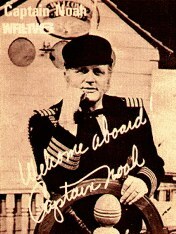 "I Can Sing a Rainbow" and "Send Your Pictures to Dear Old Captain Noah" are forever burned in my mind. We used to argue about the last word to the chorus of "Rainbow", whether it was "hue" or "too" or "tune". (What a stupid argument!) Remember Wally the Walrus & Maurice the Mouse? I think Mrs. Noah actually did their voices. How 'bout that Ms. Elaine, and Larry Ferrari on the organ? They always had guests who did like a "show-and-tell/career day" thing, but Gumby and Popeye were what I always looked forward to the most." The magical ark sailed for the last time in 1994. Merbrier also produced a show for the young adult generation called This Is It, which aired on WPVI early saturday evenings in the mid-70's and early 80's. He has also written several books, and serves as the Chaplain for the Broadcast Pioneers of Philadelphia. Stu Nahan, who later became a pretty well-known sportscaster in L.A. and appeared in the first four Rocky films, dressed as an astronaut as Captain Philadelphia on WKBS-TV ch. 48 in the mid to late 60's. Sadly, Chief Halftown passed away on July 5th. Cruisin 92.1 WVLT aired a special tribute to the Chief featuring Sally Starr, Bill Webber, Al Alberts, Francis Davis, and Jerry Blavat. Also known as The Horn and Hardart Children's Hour, this one helped some major stars launch their careers, like Rosemary Clooney and Eddie Fisher. 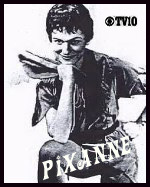 Hosted by Stan Lee Broza, the show featured musical acts and skits, and began airing on WCAU-AM in 1928. When WCAU -TV went on the air, the show ran on both radio and TV until 1958, an incredible 30 year run. 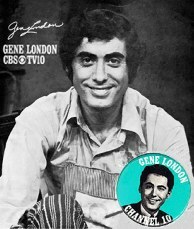 Gene London has been alive and well and living in New York City, his hometown, where he owns an expansive costume warehouse. Gene celebrated his 70th in 2001. Does anyone else remember Junior Supersports? It was on channel 3 on Saturdays around lunchtime in the late 70's/early 80's. The show had athletic competitions between local junior high schools. I can't for the life of me remember the host's name, but in my mind I can see him and hear him. I know he was one of the Eyewitness News sports guys. Anyway, the opening theme was an instrumental version of Manhattan transfer's 'Birdland.' I personally didn't think that song made sense for a sports show..." -Mike M.
Lorenzo the "clown" was actually Lorenzo the "hobo." Played by Gerry Wheeler, Lorenzo would begin the show by speaking to the audience while he applied his makeup and costume. Sally Starr returned to the Delaware Valley in the 90's after her Florida home burned to the ground. Sally hosts a Sunday afternoon Country and Western music show on 92.1 FM in Vineland, NJ, and makes numerous local appearances. 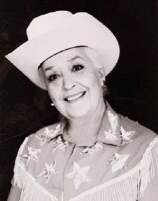 "Our Gal Sal" celebrated her 80th in Jan. 2003. Click the logo to check out her great website! Sidewalk Science featured some very cool experiments and demonstrations by host Dr. Gerry Wheeler (of Lorenzo fame). It ran on WCAU-TV ch. 10 early Saturday afternoons in the mid and late 70's. 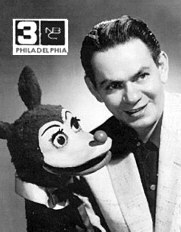 Bill Webber is the Saturday midday host on WPEN 950 AM, where he began his broadcasting career in the mid 1950's, and is the current President of The Broadcast Pioneers of Philadelphia. Bill has been all over the Philly airwaves, at WIP and WRCV (now KYW) radio, WRCV-TV (now KYW), WFIL-TV (now WPVI),WKBS-TV, WPHL-TV, and has appeared in numerous local commercials. You may remember him on Ch.6 on weekday mornings on Breakfast Time, receiving the weather from Elmo Wiffleweather, the toy that rode a tightrope.He also hosted a successful game show on channel 3 called Tug-o-War, which was highly rated but was cancelled to open up the schedule for The Mike Douglas Show. For ten years, he hosted The Wee Willie Colorful Cartoon Show ( ch. 17, '65-'74), then the "kid's block" on ch. 48, and hosted many Phillies pregame shows (ch. 17). Bill was born in Havana, Cuba, and raised in Brooklyn. Cartoon show host Willie the Worm, along with Warren Wright, aired on WCAU-TV from 1950 to 1954. Newton the Mouse was the unseen assistant who Willie called to to run the cartoons. All photos and images are property of their respective owners.